Prairie Star - by Wendy Whellum. Make your own antique Lone Star quilt, with simple strip piecing technques. 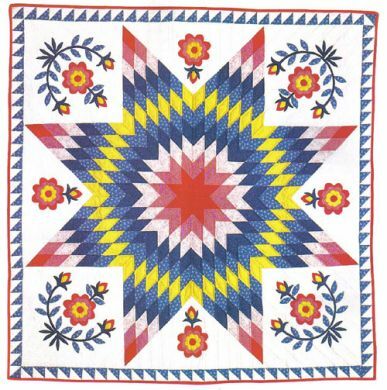 Pattern sheet includes Prairie rose applique templates. Finished size 60" x 60". Now available as a digital download only. Once you have completed the payment selection in the "shopping cart" and the order is processed, an email will be sent to you with a link to download the pattern. This needs to be completed within 3 days.